Rude American is a company known for the quality of their baseball bats other baseball gear and that’s no different when it comes to the incredibly convenient and durable, Inflatable Turtle Backstop. Rude American really strived to put out the best backstop that they could. 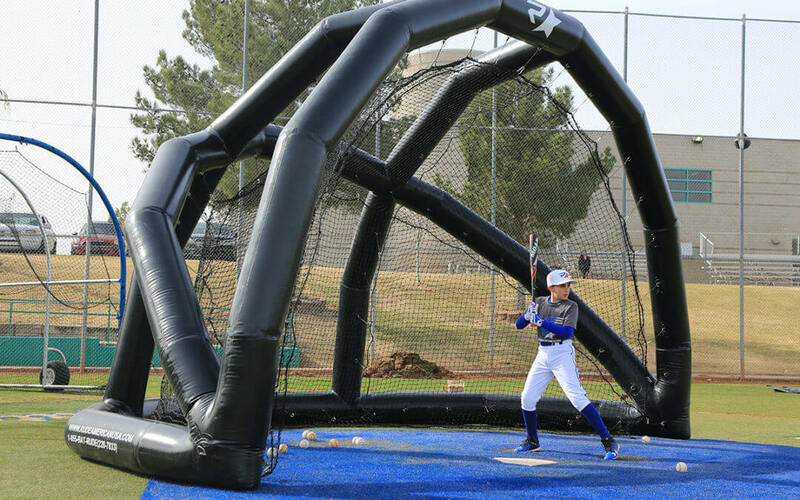 Convenience and performance really come together with the inflatable backstop. It is made has a heat shield that protects it and in inflates in as little as five-minutes! What makes the Inflatable Backstop the best? The Inflatable Backstop weighs 140 lbs and is 12 feet deep, 18.5 feet wide and 12 feet high. The quality nets come pre-hung so you just have to inflate and go! The patented Inflatable Backstop has commercial grade PVC Tarpaulin shell for indoor or outdoor use. Additionally, each unit folds up to 3 x 5 cylinders and comes with your own carry bag so it can be put away or transported! There are a ton of benefits to being able to transport your own backspot! Because the backstop is inflatable, you can bring it with you for batting practice, team practice, or even just that weekend ball game with your friends! The inflatable backstop can even fit in your backyard. We understand that running a little league or team of any age can be a burden, that is why Rude American also offers financing for all nets and batting cages so you can start dominating the game now! Contact Rude American at 1-855-BAT-RUDE (228-7833) or check out rudeamericanusa.com for more quality and affordable products to meet all of your ballplaying needs.